I'm really happy with my new driveway they did. Before it was old and cracked. Excellent work done. No more weed cleaning. Love the new extention to our driveway. Did a beautiful job on seal coating & striping our parking lot. Reasonable price. Liked how the owner worked with the crew. Didn't have any issue with them. Very professional, finished a 10,000 square feet overlay driveway in a day. Cleaned up after there mess. We were very happy with the quality work they provided. 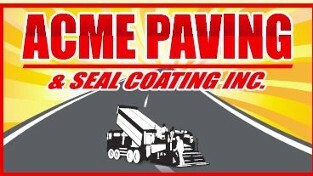 We highly recommend Acme Paving's high quality service. Awesome job done by Acme Paving, very nice crew and owner to work with. How often do you see the owner working with his crew. My husband and I just love quality workmanship. Fair and reasonable price. I am a excavating contractor I have hired many other companies to patch our trenches. I used Acme Paving first time and they did a fantastic job. Price was so low compared to other companies. They did good work, cleaned up after there mess. Plus they had extra asphalt left. Asked me if you want it laid else where. We are going to use Acme permanently now. I hired Acme to pave our private road. We had built a new custom house and the city wanted the roadway paved. I got 2 bids and Acme was the lowest and I got few references. They complete our job in 2 days. 22nd Aug.
See More On Angies List & Feel Free To Ask Us To Give You Reference To Go View.